One of the stranger, indeed outrageous, "luxury" apartment buildings in the city is this "hole-in-the-wall." The wall, of course, is the magnificent street-wall of Fifth Avenue in the low-80s across from the Metropolitan Museum of Art. To the south of the entrance to 1025 is the impressive pre-war apartment building at 1020 Fifth Avenue, one of the most prestigious in the city. To the north are the three superb former mansions - two designed by Van Vleck & Goldsmith in 1903 and the third, at the corner, designed by C. P. H. Gilbert in 1902 - that comprise the Marymount School. The actual entrance to 1025 Fifth Avenue is quite handsome. It is setback in a handsome, landscaped plaza and has a large canopy beneath 15-ft.-high, 40-ft.-wide and 1-ft. wide marble flat arch. The only thing thats missing is the building. 1025 consists of two midblock buildings on 83rd and 84th Streets that are joined only at the lobby. The lobby is one of the biggest in the city as it extends about 100 feet into the block and has its own garden court. The 13-story, sidestreet buildings were designed by H. L. Feldman and completed as cooperatives in 1955. They have many bay windows both on the sidestreets and facing the lobby courtyard, which is wide enough to provide some glimpses of the museum and Central Park. 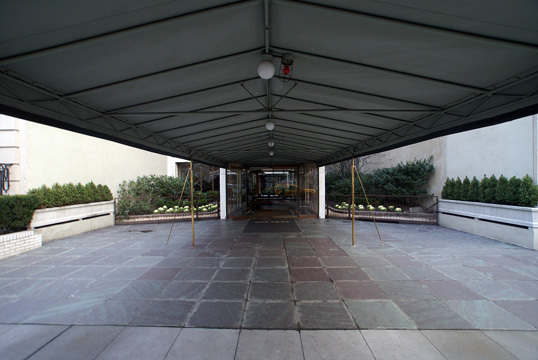 The lobby was designed by Raymond Loewy Associates and has an inclined reinforced concrete marquee above the canopy but also beneath the marble arch. The lobbys interior has black and white terrazzo paving, marble flooring, mirrors and handsome wood screens. 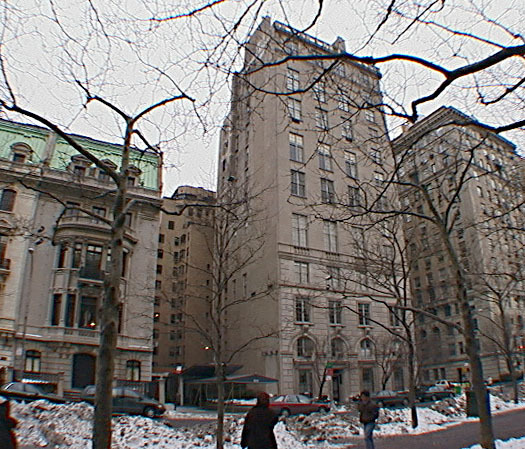 "In what was surely one of the more ingenious if urbanistically destructive moves on the avenue, the developers demolished the house and used the site for a 100-foot-long entrance arcade that would connect their midblock buildings to the avenue, collectively providing them with the prestigious address of 1025 Fifth Avenue," wrote Robert A. M. Stern, Thomas Mellins and David Fishman in their impressive book, "New York 1960, Architecture and Urbanism Between The Second World War and the Bicentennial," (The Monacelli Press, 1995). 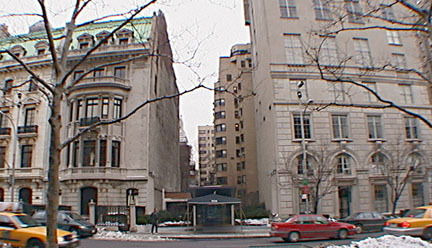 1025 Fifth Avenue replaced a mansion that had been designed by Ogden Codman in 1906 for Lloyd S. Bryce on the avenue and several buildings on the sidestreets, according to the authors. "Whatever the lobbys effectiveness, or its merit as an isolated piece of design, the absence of a building along Fifth Avenue, despite the gesture of a marble arch, dealt a significant blow to the integrity of the avenues cohesive urbanism," the authors added. 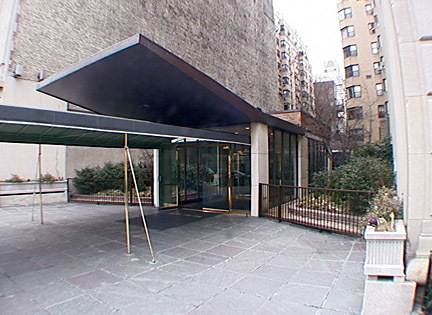 While 960 Fifth Avenue has a canopy beneath its large marquee, 1025s canopy/marquee/arch entrance has little competition in redundancy. In later years, historic preservation and landmark advocates might have been able to convince the developers to at least retain the front facade of the now demolished mansion, but this project was initiated a decade or so before the city finally enacted a Landmarks Preservation Law. The egregious but clever ploy of the developers was more than just a successful marketing ploy as its residents enjoy a very grand, albeit modern, entrance on the avenue. Perhaps in time the owners of the building will consider a redesign of the entrance that might somewhat mitigate the gaping "hole in the wall" by erecting, say, a stainless steel mobile sculptured above the marble arch that will help fill the visual void while not entirely ruining the midblock vistas from the buildings two wings. Of course, such civic-mindedness might encourage the residents of the apartment building at 1001 Fifth Avenue nearby to add some limestone panels to the sides of the "fake-front" mansard roof element atop that building. The building has a garage, a doorman and a concierge. This embarrassing building is testament to the developer's, and the residents', lack of sensitivity to urban context and a sorry reminder that many New Yorkers were not architecturally civilized in the era of its construction. In a July 31, 2007 article in The New York Sun, James Gardner wrote that the "perhaps the most notable act" of Feldman's career "was conceiving 1025 Fifth Ave., one of the most audacious instances of real estate promotion ever seen in Manhattan." "The building is really a grayish nonentity ducking for cover along 84th street near Madison, and properly it has as much to do with 5th Avenue as with the Champs-Élysées. But the developer purchased a lot along 5th, between 83rd and 84th streets and, at Feldman's prompting, snaked an entrance through the pre-existing houses - all so that residents could claim a Fifth Avenue address! Feldman's daughter hastens to point out, however, that he had nothing to do with the entrance that you see today: 'He hated it, saying it looked like a tongue sticking out.'"